Looking out the jet window at the island below, Thomas Irving had no idea what to expect when the plane finally landed in storm-ravaged Puerto Rico. 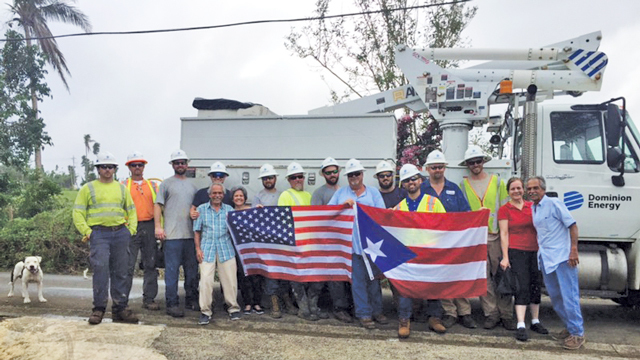 Irving, a Dominion Energy operations manager for Virginia Beach and Norfolk, was part of the advance crew headed to the island in mid-January to help with power restoration efforts five months after devastating Hurricane Maria. What Irving saw as he got deeper into the area where the hurricane had lingered and caused mass destruction was unbelievable. The summer climate brought with it 90-degree days dripping with humidity, something Irving’s body had to adjust to after leaving snowy Virginia in January. Torrential downpours followed by blazing sun and blistering heat were daily occurrences. The crews would finish up in one area and then cross the mountain to continue working, and the locals weren’t far behind. “They made their way across the mountain to feed us,” Irving says. Both men said that on every project, no matter how long the Dominion Energy crews were on the job, someone in the community would come up to them to say hello. “They would offer us a bottle of their water, and they might only have two bottles for themselves for a week,” Hagerman says. 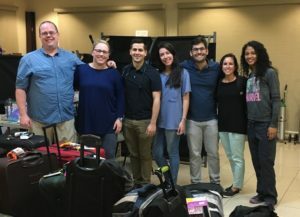 Puerto Rican Alicia Díaz, assistant professor of dance with the Department of Theatre and Dance at University of Richmond, understands the community pride from Puerto Ricans even in the midst of disaster. She is saddened by the effects of the hurricane, but recognizes it wasn’t just the savage winds that brought down the island’s ability to bounce back. The outreach team from VCU included pharmacist Emily Peron (second from left) and psychologist Carla Shaffer (second from right). The island was going through a deep political and financial crisis long before the hurricane. To understand the depth, one must understand the island’s history. Puerto Rico became a colony in 1898 when the U.S. acquired the island at the end of the Spanish-American War under the terms of the Treaty of Paris. It became an unincorporated territory in 1952 under President Truman. Because of the island’s 11-year recession and approximately $73 billion in public debt, the control board cut funding to everything from public services and education, creating a “dire situation,” Díaz says. The cutbacks proved detrimental to relief efforts after Hurricane Maria. 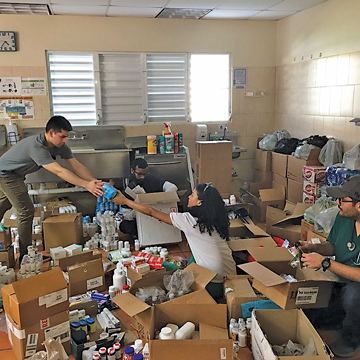 The VCU team of volunteers prepares donations for distribution in Puerto Rico. It’s remarkable to her that some of the people of Puerto Rico are still without power or water. “In a country that is legally part of the U.S., it’s shocking,” she says. But the people in Puerto Rico are resilient. Some are now “engaged in a struggle to find ways to rebuild,” she says. “They are imagining new ways that are more sustainable and equitable.” Groups within a farmers’ movement are taking this as opportunity to think of sustainable farming and sustainable agriculture. Diaz says brigades of people are coming together in a humanitarian effort to help particular areas on the island clean up. Many of those needs were related to mental health. During 2017, Puerto Rico’s suicide rate rose more than 20 percent over the previous year according to the island’s Department of Health. 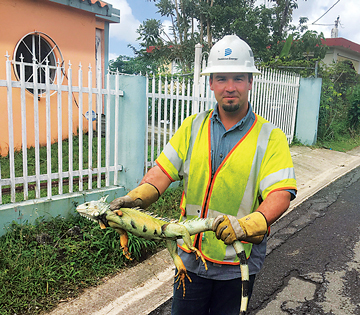 Puerto Rico’s landscape and cityscape are home to iguanas, boas, and more. Inland, it looked to Dr. Shaffer like Hurricane Maria had just passed through. “Bridges hadn’t been rebuilt, but life had to continue without the resources they had before,” she says. She believes the local effort for community- driven change isn’t talked about as much as other aspects of the aftermath. One medical student she met was working up to six days a week to help people get back on their feet. “That is the piece you don’t hear about. Communities can do a lot when they work together,” she says. Dominion’s Alec Hagerman goes for a welcome home handshake after the crew’s trip to Puerto Rico. 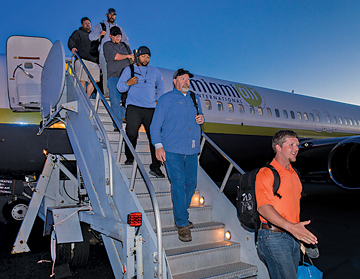 When Dominion Energy volunteers arrived on the island in January, only fifty percent of the residents had power. But thanks to Dominion crews and others from across the country, more than eighty percent of the residents now have power, although some service has been inconsistent. During their month-long mission, Dominion crews installed 226 new poles, reworked hundreds more, and replaced more than fourteen miles of power lines damaged by the storm. 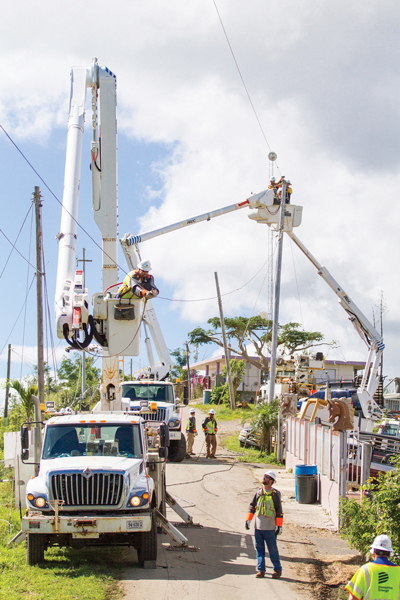 Two thousand more homes on the island now have lights, air conditioning, and refrigeration. Previous articleIncreasing Your Health Factor!